The Kore Teen Wobble Chair will engage your high school or college students in active sitting. Its gently-rounded bottom facilitates subtle, healthy movement, while students are working. This movement exercises the back, legs, and abdominal muscles, and promotes ergonomic positioning. Constant shifting of weight helps improve focus and minimize distraction. 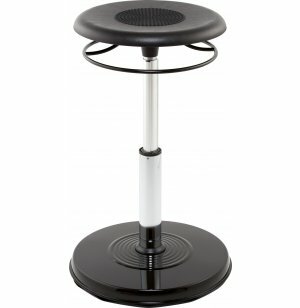 This adjustable wobble stool gives each person an individualized fit, with easy-access, pneumatic height adjustment right under the seat. The black vinyl cover on the stamped steel base, and the black plastic seat, complement the sleek chrome cylinder beautifully. With this innovative modern design, it’s no wonder that this active seating has been featured in the New York Times Personal Shopper Column and sold in the Museum of Modern Art (MoMA) design store. Active Seating: The gently-rounded base promotes ergonomic, healthy movement. Healthy Design: Exercises the abdominal muscles, legs and back. Smooth Adjustment: Easy-access ring adjusts the height from 18-25” via a pneumatic cylinder. 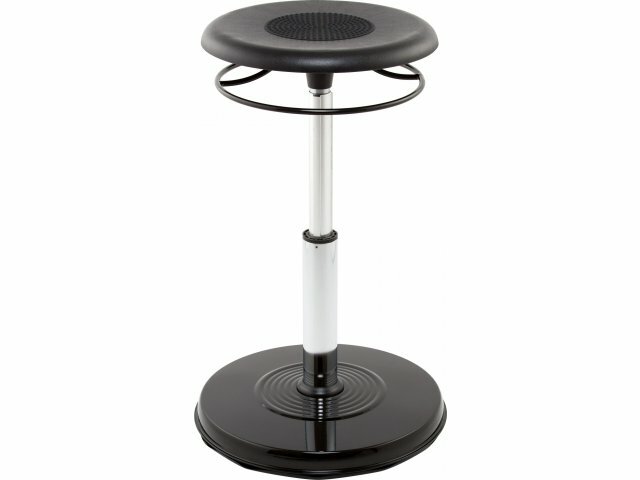 Sturdy Support: Stands on a black, powder-coated stamped steel base with a vinyl cover.